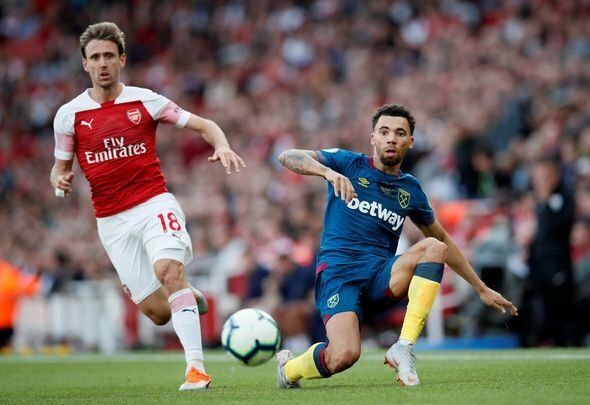 Many West Ham supporters were left fuming upon reading Ryan Fredericks’ remarks about what the team had being doing in training. The 25-year-old defender in an interview with the club’s official site shared that the Hammers had been working hard in the international break before revealing what Manuel Pellegrini had his side focusing on during training. “We’ve been working hard over the international break and we’re confident of a much better performance and hopefully a better result on Sunday,” said Fredericks. “We’ve gone over the fundamentals of how we want to attack and how we want to defend and done a lot of fitness-based stuff because it’s important to keep fitness levels high and improve on them as well. The news that the Hammers’ squad had been working on their basics and doing a lot of fitness-based work had a large section of fans furiously questioning what the club did in pre-season. One supporter stated that he didn’t need a UEFA qualification to know what the basics of football are while another revealed that they thought all this sort of work was done in pre-season. Run, be committed, close down the opposition as a team, tackle the opposition not constantly standing off. Simple passes no fancy stuff until the game is potentially safe. PeL the rest is up to you ! I don’t need a UEFA qualification for that. What were we doing all pre-season? This should have been sorted in pre-season! The Hammers really need to stop tweeting these interviews with players as they just seem to antagonise fans. Each passing day seems to see another senior player at the club deliver an interview that is filled with several questionable statements. 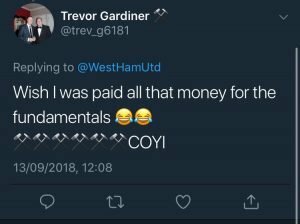 It’s easy to see why these Hammers supporters are fuming following Frederick’s comments as it’s so weird that they’re going over the fundamentals and working on their fitness. Fans are right to be pointing out that pre-season is normally the time when those sort of training sessions are scheduled and it is a bit of a mystery why Pellegrini is going over them now. 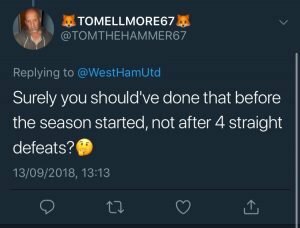 It implies the Hammers boss didn’t do enough with his side in pre-season and that this is a reason why the club have failed to get any points on the board in the Premier League as of yet. Pellegrini must see his side secure a good result at Everton on Sunday otherwise it seems likely that angry Hammers fans will continue tweeting their rage over the handling of the first-team.